This is the first in a series of DyeStat year-end awards for 2006-07. The DyeStat Most Outstanding Performers series will include boys and girls distance, sprints, hurdles, jumps, throws, and multi-events. These will be followed by the DyeStat Athlete of the Year award. Selections are made by DyeStat editors and are based a combination of multiple major victories/honors won and performances on all-time and yearly lists. Performances from outdoor track, indoor track, and cross-country are taken into account. The Broadneck MD senior, burdened with the “potential” label by the masses from being the son of an Olympian, truly came into his own during the spring in becoming the nation’s best prep distance runner. The apex of the year came as he took advantage of great competition and some of the best post-season distance-running conditions ever to lord over the NON 2-mile field in 8:41.55. In what was arguably the best prep deuce ever, he slipped ahead of Prefontaine on the all-time list and surpassed all of the other great high schoolers from this decade. There was plenty else good about Centro’s season, too. He came out on top during the 2nd of two nip-and-tuck 1500 duals with future U. of Oregon teammate A.J. Acosta, winning the Pan American Jrs. title at that distance. He ran the year’s #2 mile with his 4:03.40 at the New York Reebok Grand Prix, taking 11th in a field of pros, then virtually matched that in an American Milers Club race after USATFs with 4:03.47. And he completely ruled a great field of milers at Penn, hitting a meet-record 4:08.38. Matt also had a fine indoor season, which basically set the stage for outdoor and included a solid runner-up finish to Craig Forys in the NIN 2-mile. Cory was expected to be part of the big NIN 800 showdown, with undercover standouts Axel Mostrag and Chris Bilbrew, but it never materialized for the Westlake CA senior, as he dropped off in the 2nd half and finished 8th. 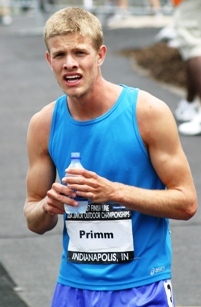 But if you thought that was going to be an indicator of Primm’s outdoor season to come, you were dead wrong. Among a group seemingly filled with sub-1:50 talent, he ruled the outdoor season from beginning to end – running the best times, winning the major titles, and showing the staying power as many of the other top dogs faded or suffered injuries. Victories at Arcadia (1:49.50) and CIF set up a dominating post-season, where Cory topped the NON field in the best time of the year, 1:48.63, then took the USATF Juniors crown. The indoor title race had been long forgotten. If the Yellow Springs OH senior was part of old-time Hollywood instead of the today’s prep track scene, then one of the most popular hits of the year surely would have been The Legend of Sam Borchers. 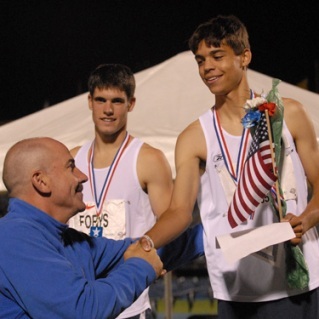 Beginning with his unlooked-for explosion on the scene at the 2006 USATF Juniors, continuing the speculation that accompanied an absence from the national highlights in XC, and building through a successful, but not truly revealing outdoor season, the mysterious aura around this athlete built to a level rarely seen in the internet age. 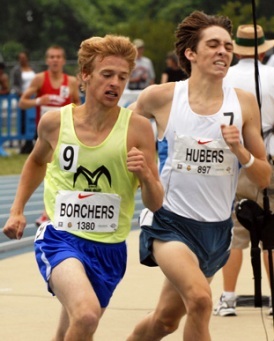 But finally in Greensboro this spring, Borchers took the biggest stage for the NON mile with all eyes on him and a full set of expectations – and then saw Ben Hubers almost steal the race with one of the boldest efforts in recent memory. Sam had to be patient and wise, and realize he was going to have to redline just to keep in striking distance, then outlast his foe for the win. He did it, though, staggering across the line in a US#1 4:03.33. The bubble burst a bit at Indy, as Acosta beat him again in the strategic 1500, as well as Centrowitz. Borchers really needed another big win to earn a spot here, but he already had it with his sit-and-kick win during the NIN mile. Traditionally, it is at least two “major” victories in a category during the school year that will earn an athlete mention here, but in Craig’s case, it was really a matter of outstanding running at or near the top all year long. Perhaps no male distance runner bore such high expectations from the masses going into his senior year, but Forys met them in almost every way with a fast, consistent campaigns in all three seasons. In XC, the Colts Neck NJ senior was undefeated (purists could argue that his Manhattan winner was 0.1 slower than Tommy Greuenwald’s in a later race) and the Foot Locker NE champ going into Foot Locker Finals, before getting 2nd to Chad Hall. His indoor season, mostly featuring his legendary relay carries, was tempered somewhat, but Craig was ready for the biggest challenge and beat Centrowitz in the NIN deuce for his first national title. Outdoor again was more relays early, highlighted by a 4:04 carry in the Penn DMR, but in the Henderson Invite, he let loose with 8:48.99 2M. At the NJ Meet of Champs, he had one of the best 1-day doubles ever with a 4:09.59/8:52.58. Finally, it was NON and a rematch with Centrowitz. 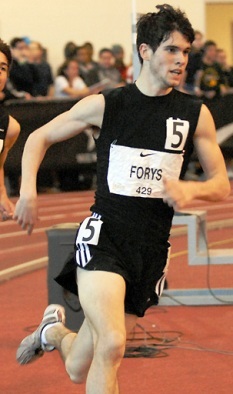 Like Foot Locker, Forys was beaten, but with a great effort – his 8:44.53 rated him #8 all-time. Elliott could turn out to be the best long distance runner or future World-Class harrier of this year’s group, based on some of his performances. At the beginning of the fall, the Winona MN senior had yet to truly distinguish himself from a strong group of Minnesota harriers (thanks in part to the arrival from WA of Hassan Mead) and even as Foot Locker MW rolled around, he was hardly a lock or anything to make it. But Heath ran very well in Kenosha to qualify 3rd. In San Diego he was only 33rd, though, so when he showed up on the entry list for USATF Jr XC, he wasn’t given much of a shot to make the team. But in one of the year’s most stunning races, he not only made the team, but won the meet. During the spring, Heath was somewhat submerged again in the mass of 9-flat 3200 types, but now people were watching him and knowing he was ready for a breakout. It came at NON, where he was a very strong 3rd in 8:46.12. He wisely went for the 5k at USATF Jrs and used a blazing last lap to take the crown, then nearly did the same at Pan Am Jrs before settling for 2nd. Ben Hubers GA – NON runner-up (4:04.98y) highlighted very consistent spring with several sub-4:10s. XC season highlighted by Great American win.